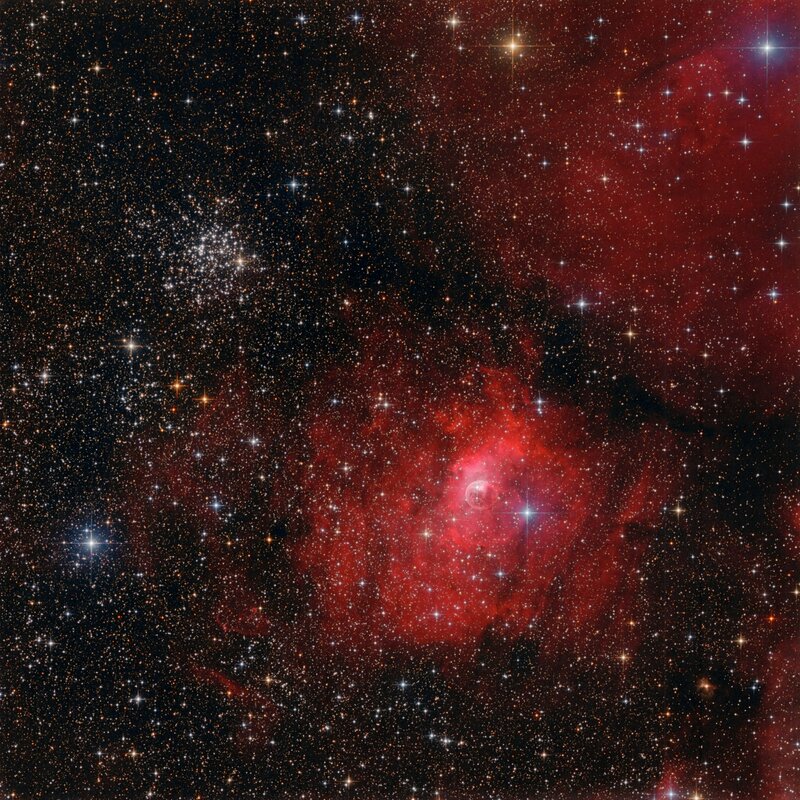 NGC 7635 or the Bubble Nebula is an emission nebula located in the northern constellation Cassiopeia. It lies at a distance of 9,000 light years from Earth. It is also known as Caldwell 11 or Sharpless 162. It was nicknamed the Bubble Nebula because of its shape, which was created by a strong stellar wind from a young, massive, hot Wolf-Rayet star SAO 20575 that shed its material to form the nebula. The star’s radiation ionizes the bubble-shaped shell, causing the nebula to glow. NGC 7635 is located near a large molecular cloud, and lies roughly in the same direction as the open star cluster Messier 52, near the border with Cepheus constellation. Due to interstellar absorption of light, the distance to M52 is uncertain, with estimates ranging between 3,000 and 7,000 light years. Messier 52 contains white, young hot stars and is estimated to be about 35 million years old.